← Is Syria on the way to becoming a ‘frozen conflict’? On Wednesday, Russian aircraft carried out the first bombings of rebel positions in Syria. The operation was not a surprise. It was the latest, most dramatic episode in a significant increase in Russian support for the beleaguered regime of Syrian dictator Bashar al-Assad and has been under way since the beginning of last month. This sharp increase in Moscow’s aid to Assad has brought the marines of Russia’s 810th Independent Naval Infantry Brigade to the port of Latakia, Syria’s principal port city. At least 500 of these elite troops are assembled close to the Russian naval depot at Tartus, on Syria’s west coast, having arrived from their base with the Black Sea fleet in Sevastopol, on the disputed Crimean Peninsula, in the past month. Moscow is sending hardware as well as troops: 28 combat aircraft at the last count — four Sukhoi Su-30 fighters, 12 Su-25 strike aircraft, 12 Su-24 attack fighters — along with numerous attack helicopters, seven state-of-the-art T-90 tanks, surface-to-air missile systems and advanced artillery. Infrastructure work is under way, too. The focus is on the Bassel al-Assad air base outside Latakia city. But the naval depot at Tartus is also being expanded. Satellite imagery recently published by IHS Jane’s Intelligence Review (in an article co-written by this reporter) shows additional infrastructure development at the Istamo weapons storage complex near al-Sanobar, also in Latakia province. Newly paved surfaces at Istamo were apparent. Temporary housing for up to 2000 personnel, of a type used by the Russians, also was visible near al-Sanobar. All this represents a strategic move by President Vladimir Putin, of wide import and profound implications. The Assad regime is a longstanding ally of Moscow. This alliance goes back to the 1960s, when radical and pro-Soviet Arab nationalists first took power in Damascus. Putin has been backing the regime in its war with the rebellion against it since 2011. Russia’s help has already proved invaluable. Moscow’s veto power at the UN Security Council made sure that no co-ordinated international action against the regime could take place in the early, optimistic days of the uprising. The continued supply of Russian weapons made sure that Assad’s armouries remained well-stocked. Nevertheless, the present move is of an unprecedented scale. So why is it happening, why now, and what is Moscow seeking? The most immediate reason for the sharp increase in Russian assistance to the Assad regime is that the dictator has been losing ground to the rebellion in recent months. Worse, from Moscow’s point of view, the rebels’ gains were bringing them close to the parts of Syria whose retention by the regime is essential for Russia. Assad’s main problem, throughout the civil war, has been the shortage of men willing to take a bullet for him. This shortage of manpower was a product of the regime’s narrow support base. The Alawi sect, to which the Assads belong, comprises only about 12 per cent of the population of Syria. The increasingly Islamist rebellion found its ranks further strengthened by foreign volunteers. Assad had no similar line of support from young ideologues committed to his cause. But he did have assets and a strategy. His main asset was the loyalty of his allies. In contrast to Western countries that ostensibly supported the rebellion but did little practically, Assad’s Russian and Iranian allies did all in their power — diplomatically, politically and militarily — to keep their client in his seat. The Iranians mobilised regional assets, including the capable Hezbollah militia in Lebanon, to join the fight and lessen the manpower problem. The Russians were there with weapons and diplomatic backing. In terms of strategy, the dictator sought to lessen the problem of manpower by retreating from all areas not considered vital. The result of this strategy has been the emergence of the de facto partitioned Syria of today. 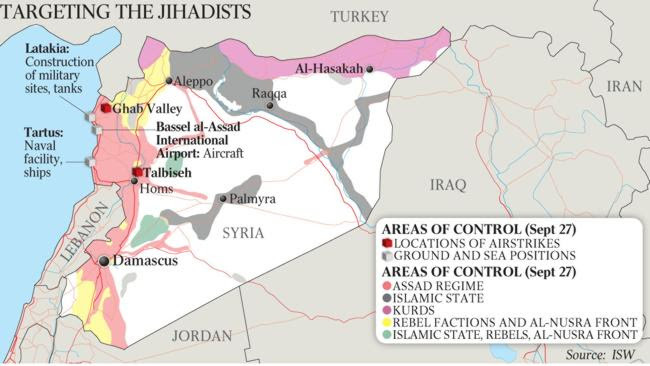 Assad effectively has ceded huge swathes of eastern, northern and southern Syria to his enemies. Today, Islamic State controls most of eastern Syria. The Kurdish PYD (Democratic Union Party) rules a large area in the northeast and a smaller enclave in the far northwest. Islamist rebels, including Jabhat al-Nusra, also known as al-Nusra Front, the local franchise of al-Qai’da, rule a swathe of the northwest. Western-backed rebels and al-Nusra control Quneitra province adjoining the Golan Heights and much of Dera’a province south of Damascus. The regime still holds Damascus, the western coastal area and the line of cities to the capital’s north (Homs, Hama and part of contested Aleppo). The problem with the regime’s strategy of retreat and consolidation is that it can be carried only so far. At a certain point, the erosion of the regime enclave will reach a point that makes Assad’s survival no longer viable. In recent months it has looked as if Assad was in danger of reaching this point. This is the immediate precipitating reason for the increased Russian intervention. A new, more effective rebel coalition called the Jaysh al-Fatah (Army of Conquest) declared its foundation on March 24. Backed by Qatar, Turkey and Saudi Arabia, this alliance achieved a string of battlefield successes against the regime in the vital northwest of the country this past northern spring and summer. On April 25, this force took the strategic town of Jisr al-Shughur. This raised the possibility for the rebellion of moving the frontline into the populated areas of Latakia province. This would have brought the rebellion close to the Mediterranean, including to Russia’s naval depot at Tartus. It also would have called into question Assad’s ability to defend any of the remaining areas under his control. This had to be stopped. The Russian deployment is part of a concerted effort to stop it. Moscow is set to shore up the regime’s crumbling defences. In his speech at the UN General Assembly this week, Putin spoke of Assad’s armed forces as those who were fighting “terrorism face to face”. But it should be understood that the immediate danger to Assad’s regime in Syria’s west is represented not by Islamic State but by the rebel Jaysh al-Fatah coalition. Since Russia’s goal is the preservation of the regime, Moscow’s efforts to protect Assad are set to be directed against the Syrian rebels rather than Islamic State, whose main forces are located farther east. This was reflected in the choice of targets in the bombing raids on Wednesday. So Russia’s intervention represents a sharp increase in the dimensions of a longstanding policy rather than a radically new departure for Moscow. Putin’s intention throughout has been to demonstrate the value of alliance with Moscow by showing how he protects his friends (and, while he’s doing it, to hold and expand Moscow’s only naval base outside of the former Soviet Union). How far will Putin go? According to Sergey Ivanov, head of Russia’s presidential administration, the goal of the Russian deployment is “strictly to provide air support for the (Syrian) government forces in their fight against Islamic State”. Putin undoubtedly is concerned about Islamic State’s rise and what its proliferation could mean for the restive Caucasus region and central Asia. One of Islamic State’s main military commanders, Abu Omar al-Shishani, is of Chechen-Georgian origin, and volunteers from the Caucasus are among the most brutal of the jihadi fighters in Syria. But the deployment of the Russian forces in Syria indicates beyond doubt that the main concern of the Russians is to defend Assad against the rebels. The proclamations against Islamic State are a feint to add moral authority to the defence of the dictator. In so far as Islamic State represents a threat to Assad, it does so in the Damascus area and in the Homs province. Islamic State ­forces are pushing across the desert, past Palmyra, nudging against Homs province and in some parts of Damascus, including Qadam and the Yarmouk camp. But the Russians are not deploying in any strength in this area. Their deployment is on the western coast, a considerable distance from Islamic State but close to the lines of Jaysh al-Fatah (and taking in Russia’s naval assets in Tartus). The Russians have begun flights of Pchela-1t unmanned reconnaissance vehicles out of Latakia. These UAVs are conducting patrols over rebel-held territory to the immediate east of Latakia, not over Islamic State-held areas. Given the scale of the deployment, there are no indications that Russia is set to take part in a major campaign to reconquer areas lost to the Assad regime. Rather, as it appears, the Russian intention is to prevent the rebels from pushing further into regime-held areas. This will enable Moscow to preserve its assets in western Syria (it has little interest in or need for land farther east). No less important, it will enable the Russians to keep the Syrian war going. Putin sees the eastern Mediterranean as the back yard of the West. In strategic terms, maintaining assets in an ongoing conflict in the West’s back yard is a natural goal as a means to offset the West’s holding of assets in Russia’s back yard: the former states of the western Soviet Union, most importantly Ukraine. So Russia’s determination to keep Assad in the game has a logic far beyond Syria. But almost certainly it does not include the costly and probably unachievable goal of winning complete victory for Assad. The intervention is the latest bold move by a Russian President who perceives a strategic vacuum in the eastern Mediterranean, deriving from the US desire to avoid major commitments in the area. The failure to act following the regime’s use of chemical weapons in 2013 and half-hearted efforts by Western countries on behalf of the rebels reflect this Western determination to stay out as much as possible. In such a situation, Putin is likely to have calculated that a firm move on his part on the regime’s behalf in Syria would be without negative international consequence for Russia. Framing the intervention in terms of the joint opposition to Islamic State would further contribute to lessening any chance of Western objection. As of now, this assessment seems to have paid off. The West appears to be backing off from its previously stated goal of demanding Assad’s departure. The result of Putin’s move and Western acquiescence to it is to introduce a new and powerful strategic player into the Middle East. Russia appears to be making additional moves to consolidate its co-operation with other forces aligned with Syria. This week, Iraq announced an agreement with Moscow for sharing intelligence on Islamic State. Supporters of the so-called resistance axis in the region (which includes Iran, Iraq, Assad’s Syria, Hezbollah and Palestinian Islamic Jihad) are depicting the Russian intervention as part of a larger process in which Moscow is concluding an overall alliance with this axis. One of these, Ibrahim al-Amin, editor of pro-Hezbollah newspaper al-Akhbar , has named the new alliance as the 4+1 bloc (Russia, Iran, Iraq, Syria plus Hezbollah). Moscow certainly would deny the establishment of any such alliance. And it is notable that Russian diplomacy in the region has included an attempt to keep channels of communication and co-operation open with the enemies of Iran and Assad, including Israel and Saudi Arabia. The precise contours and implications of Putin’s intervention into Syria are not yet clear. Russia’s economy is weak and this may well prevent Moscow doing much more than keeping its allies in the game. But what may be asserted with certainty is that Russia has returned as a determined and visible player on the ground in the Middle East for the first time since the collapse of the Soviet Union. Moscow looks poised to call the next round of shots in the contiguous area that once comprised the now collapsed states of Iraq and Syria. This represents a new strategic reality in the Middle East. For now, it’s Moscow rules in the eastern Mediterranean.